Here's a pattern and instructions for two styles of brimmed hats with crowns made from six identical pieces. I like to make these from reclaimed materials. The orange one used to be two shirts, and the brown one used to be two handbags. Once you've made a couple, you can throw one together in about 45 minutes. The brims are made of plastic rescued from the packaging for a dress shirt. Other possible sources are plastic spiral notebook covers (not the cardboard ones, though) or blister packaging if the product is big enough to have about 6" x 4" of flat (or gently curved) plastic. The smaller brim would probably fit on a plastic milk or juice jug. The orange one has a zipper on the crown under which you can put any kind of Sekrit Surprize. The zipper was part of the neckline of the original shirt, which I cut to fit. I also like to put pockets on the crown, as I did with the brown one. 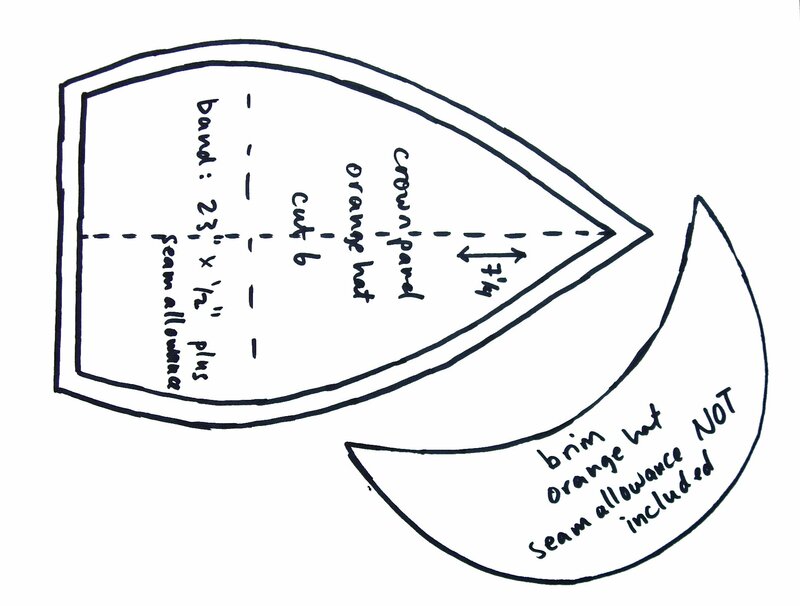 This tutorial shows the construction of the brown hat as I'd already made the orange one. However, the technique is almost exactly the same for both, just the pieces are slightly different sizes. I like to make these hats from reclaimed materials. The orange one used to be two shirts, and the brown one used to be two handbags. Most materials are suitable, except for very thin ones. If your fabric is very stretchy, interface the band so it's more stable. You can of course also use yardage. You need about 2 or 3 square feet for either hat, which is usually not more than 3/8 of a yard. One shirt would be plenty, I used two only because I wanted a contrast. I suggest using a lining so you don't get bits of thread in your hair whenever you wear your hat. If you have enough, and it's not super heavy, you can probably use your main fabric. An old t-shirt works well too. I mentioned the plastic for the brim in the intro. You need some of that. Finally, you need about 4 or 5 feet of quilt binding, which is like very wide seam binding, an inch wide. It's available in packages of 3 yards in any fabric store. You can substitute another piece of fabric the same dimensions as the band, but I find quilt binding is easier and faster. Finally finally, you need thread and a sewing machine. No special stitches are required, any old sewing machine will do. Download and print out the pattern for either the orange hat or the brown hat. The patterns are each marked with inches to show how big they are supposed to be. You may have to play with a copier to get the exact right size. The images could be improved, and maybe once I get better at using the GIMP I'll upload better ones but these will work fine if you enlarge them to the sizes marked. Cut six each of the crown pieces, the ones shaped like a bulgy triangle. Cut another six out of your lining fabric, if you choose to line your hat. The crown pieces have seam allowance, 1/4 inch, marked on them. Cut a brim out of your scrounged plastic material. The easiest way to do this is to trace the pattern with a sharpie and cut along those lines. 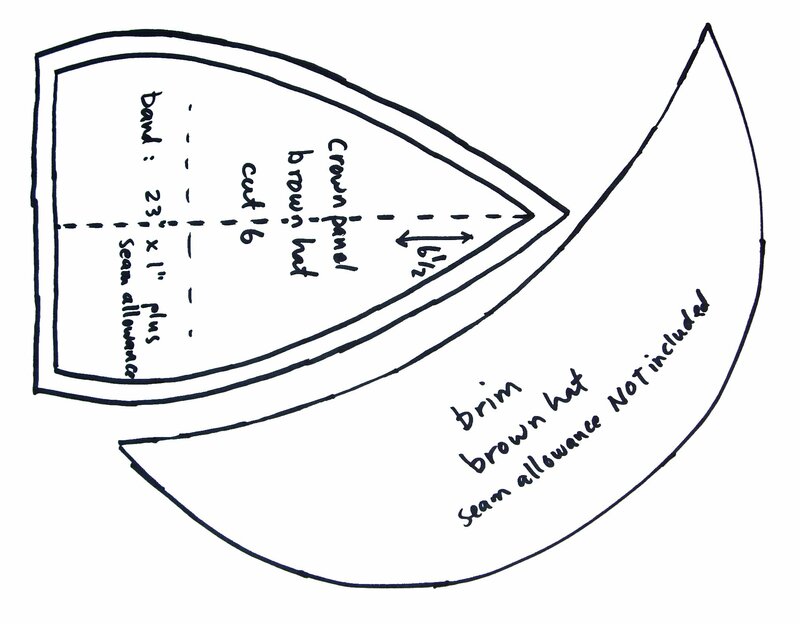 Note that the brim piece does NOT include seam allowance, for this purpose. Cut two of the brim pieces out of fabric. You will need to add 1/4 inch of seam allowance to these. I usually do this by tracing the plastic brim piece and then cutting 1/4 inch out from that. If your eye isn't that accurate (and I've been doing this for 25 years), do the tracing and then draw a second line 1/4 inch outside it and cut along that one. Optionally, cut a pocket piece. This needs to be a bit taller than the finished pocket as you'll be folding a bit over at the pocket edge. Look at the next step for how this is done and you'll see how to cut it. First, make a nice edge at the top of the pocket. Fold the top of the pocket piece back on itself, with the front of the fabric inside, about 1/2 or 3/4 inch. Sew each edge down at about a 1/4 inch in from the sides (pic 1 & 2). Then turn just this bit inside-out, or really right-side out, so the edges are folded inside and the flap is on the wrong side of the fabric (pic 3 & 4). Stitch across the top to hold this flap down (pic 5). Next I pinned the pocket to one of the crown pieces, using the gathering thread to help me with the curve (pic 7), and stitched that down. And now the pocket is complete. Stitch the lining pieces together. They're kind of like pie slices, if you ignore the curving parts near the wide end. For your first hat, do the lining first to get a feel for the curves of the crown. Otherwise you can do the main pieces first and then the lining, it doesn't really matter. You may be tempted to stitch them together in pairs and have three fat pie slices, but resist that. Stitch two segments together, then add a third, for half a pie. At this point the temptation is to add a fourth segment (and then fifth, etc) but don't do that either. Stitch the last three together just like the first three, so that you have two half-pies. You can then sew the final seam, which will now be one straight line. Trust me that you do not want to try to stitch the sixth piece of a pie in place around the point of it. Even the last third is difficult - going around points is just Hard and there's no need to do that here. Stitch the main crown pieces together, exactly the same way you did the lining. If you added a pocket, it's slightly easier if the piece with the pocket is one of the middle sections of your pie-halves, but it's not a big deal. Now, put the crown and the lining together, with all the raw edges inside. Pin around the edges and run a line of stitching to hold the lining in place to the crown. It should be starting to look like a real hat now. Now it's time for the brim, which is a bit tricky. Sew the two brim pieces, right sides together, along the outer edge - you have a drawn line here to help show you exactly where to stitch. Slightly smaller is better than slightly bigger, here, so sew to the inside of the line if you find yourself choosing. Turn the hat brim cover right-side out. You will now insert the plastic brim stiffening. You'll stretch the brim fabric a bit while doing this, and you'll want to pin the inside edges together as you go. This is to keep the plastic from coming out or shifting around while you get the rest of it in. Start at one end, and slide the plastic in along the fabric, keeping it to one side of the seam allowances from the outer edge. Get the pointy bit of the plastic at approximately 1/4 inch inside the inner edge of the brim fabric. Again there is a line here to help out, but it's on the inside of the structure and harder to see. Put a pin through both the fabric pieces, as close to the edge of the plastic as you can (but not through the plastic). Now move an inch over, push the plastic in a bit more, and add another pin. Repeat until you reach the opposite side. The pins need to run from left to right, assuming you're holding the brim with the raw edges up. For right-handers this is normal, but you lefties should make the effort to put the pins in 'backwards'. This is because sewing machines are all right-handed, and if the pins run the opposite direction you will not be able to get them out easily as you sew, as the presser foot will be in the way. Once the brim is all pinned, stitch along your pin line to hold it together while you attach it to the rest of the hat. If your pins are in the right direction, you'll be able to easily take them out as you sew along the edge of the plastic, and the later you take the pins out the less shifting of the brim you will have. Sew the two ends of the band together, right sides together, using a 1/4 inch seam allowance, to make a circular shape. Try this on your head, it should be a little loose but not more than a couple fingers' worth. Adjust it if you need to. Next, sew the brim to the band. This is a bit tricky since you're sewing a straight piece (the edge of the band) to a curved piece (the brim), and the curved piece is not very flexible. Take it slow and feel through the fabric for the edges every couple of inches. Make sure you're not either a) sewing through the plastic brim stiffener or b) getting too near, or off, the edge of the seam allowance. It's easier to do the seam if you put the brim underneath and the band on top, although it's a bit harder to see what you're doing. You can cut a piece of fabric for the band lining but I always just use quilt binding which is pre-cut and pre-folded to the appropriate size, plus it's lightweight and flexible. It's available in most fabric stores in a variety of colors, mostly boring, but since it's on the inside, who cares? Cut a piece an inch or so longer than the band, or just start at one end and cut it to size when you're done. Start at the center back, opposite the brim, on the same edge of the band that the brim is on (see the picture that illustrates this). Open out the binding and fold the end down about a quarter inch as in the first picture. Fold the binding under the band to the inside, pin, and stitch it in place (this seam isn't required, but it makes the final step of attaching the crown easier). The final step! Attach the crown to the band/brim. This is rather easier than sewing anything to the brim. Although the crown edges are not exactly straight, they're a lot easier to work with than the stiff brim. First, pin the crown to the band, outsides togehter. Ease or stretch a bit if they don't exactly match. It's fine if they're off a bit, I don't worry unless the band is bigger by more than about half an inch, or the crown is bigger by more than about an inch and a half. Just make sure the bigness is spread out evenly. Consider the placement of the pocket with reference to the brim, if you added a pocket. Sew this seam together along the stitching line you just did. Next, bind the raw edges using one last piece of quilt binding. The technique is very similar, start with an unfolded edge and fold the end down a quarter inch. Stitch all the way around over the fold, which should be on top of the old stitching line. Now fold the loose piece of quilt binding over the raw edges and down to the inside of the hat. Make sure the other pre-folded fold is folded (how's that for clarity!). Pin if you are more comfortable with that, or just sew "in the ditch" of your last seam, making sure to catch in the folded edge underneath. This is called binding an edge, and it's hard to describe, so take a look at the pictures. Wear it proudly! Note: hat not responsible for peculiar expression on face. I printed the orange hat pattern. Why are the pieces so small? Because I didn't know how to make the PDF print to size. You can alter it on a photocopier that has a zoom feature, or on any photo editing program. There are inch measurements marked on the pattern to show the size it should be. I used the orange hat pattern with the brown hat bill to make a Mario hat for my son's Halloween costume out of craft foam and hot glue. Ha ha OMG I love the Mario Hat idea! Great Job! Thanks for a really well done instructable - I'm fairly novice with the sewing machine and my hat turned out great! Somebody needs to make a flexagon hat, that's sorta reversible, but is more than two hats in one. I love that style of hat but they cost too much to buy a nice one. I wish I could sew but many of my gender is missing that gene. No - your personality is missing the "give it a try" attribute. So give it a try. I'm trying to add a brim to an existing beanie, and doing it by hand sewing too. What, the male gender? Nonsense! Check out the great work done by men in making some of my other hat instructables. You can do it if you want to! Are there any pictures from someone making the Orange hat? If you can't find suitable plastic to reuse for the brim, I've found that plastic stencil blanks work great. I made a few more to donate to cancer patients through my mom's art group, including one I modified the pattern for to make it brimless and reversible. I have been looking EVERYWHERE for a hat pattern like this. This is EXACTLY what I wanted. I am almost finished with the orange hat pattern, and while I am a bit confused in some areas of the directions, I am managing to get it right (and I'm a very experienced sewer). I love the way it looks!!!! Thanks, Rachel. This is AWESOME!!! I'm making one to match an Amy Butler (www.amybutler.com) dress I have in progress! I am going to be making more than one of these. I wear hats all the time and like this style. Shouldn't the carpenter's rule be stated "measure twice and cut once"? I also made one for my brother and one for my daughter. the green one was heavy woven stuff that was a bit hard to work with, the blue a shirt my daughter couldn't wear because ithe fabric was uncomfortable on her skin, ok as a hat though! That fabric forced me to use interfacing for the first time, as it was a bit light and floppy for a hat on it's own. awesome! thanks for the pix, those look great. oh yeah, I made one for my sister too, no pic, but it's black and white plaid with two little bows on pins next to the brim, lining black with pink polkadots. LOL. I always put needles in the "wrong" way xD It is always hard to remove the pins, and I end up screwing up the stitching. A million THANKS for posting this. I had a book from grade/high school (1970's) that is long since gone explaining how to do this. I made a few hats and remembered some of it but you filled in all the empty spots. I sure do appreciate it. My little GRANDSON is going to have some awesome hats now.